The linear algebra part of ojAlgo is one of its main attractions as well as an essential component to the other parts. It’s not difficult to use at all, but to fully exploit its capabilities there are a few things you need to know. First let’s have a look at the very foundation of ojAlgo and its various array, vector and matrix classes. It all starts with the org.ojalgo.structure package and in particular the org.ojalgo.structure.Structure1D interface. This interface essentially declares one method – count() – returning the total number of elements/items in a data structure. It’s equivalent to the size() method of java.util.Collection but returns long rather than int. Some data structures in ojAlgo actually support containing that many elements/items. In your IDE – assuming you have a project setup with ojAlgo on the classpath – open a type hierarchy with Structure1D at the root. That type hierarchy is fairly deep/complex and encompasses a very large subset of everything in ojAlgo. Understanding at least the basics of how this hierarchy is constructed is necessary for all ojAlgo users – please spend some time exploring it! To complement Structure1D there are interfaces Structure2D and StructureAnyD, both of which extend Structure1D. Extending each of those three Structure- interfaces you’ll find the Access1D, Access2D and AccessAnyD interfaces (and many others). Access2D in turn extends Structure2D AND Access1D, similarly AccessAnyD extends StructureAnyD AND Access1D. This pattern is one of the core design decisions of ojAlgo. Anything “2D” or “AnyD” is also/simultaneously “1D” – there’s always a 1D variant of the API. How the 1D and 2D/AnyD API variants correlate is strictly specified. A large portion of the classes/interfaces in ojAlgo use generic type parameters to specify what they contain/handle, and practicly always the generic type declaration is: <N extends Number>. ojAlgo is all about numbers and maths. The Access1D, Access2D and AccessAnyD interfaces declare methods to get/extract/access one specific elements of a data structure. They each have a get(…) method returning a generic “N” (a Number subclass) as well as a doubleValue(…) method returning primitive double. Whatever Number subclass you’re working with you always have direct access to primitive double representations. That can be very handy; particularly when the internal data type actually is primitive double, and that’s by far the most commonly used type for maths. This parallel type pattern is another of ojAlgo’s core design decisions. To see another example of this, find the org.ojalgo.function.BasicFunction interface and open another type hierarchy. Notice that each of the BasicFunction subtypes have 2 invoke-methods – 1 using primitive double and 1 using a generic “N”. The ojAlgo data structures are not general purpose “collections”. They’re typically fixed size and shape, contain numbers only, and primitive double gets special treatment. They can be any-dimensional (AnyD) – matrices are 2D. They support huge data structures. You really can make use of those long element indices. They support a larger set of Number subclasses (for instance BigDecimal or primitive float). The key thing not available in the org.ojalgo.array package is “Linear Algebra”. The top level org.ojalgo.matrix package contain 4 matrix implementations – PrimitiveMatrix, ComplexMatrix, RationalMatrix and even QuaternionMatrix – as well as a few supporting classes. This is what most new users find when they’re looking for “ojAlgo’s matrix class”, but there are actually two matrix implementation layers in ojAlgo. 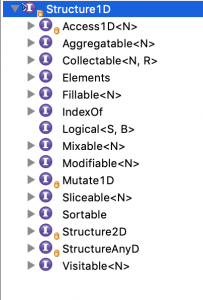 In addition to those 4 implementations there is the MatrixStore/PhysicalStore family of interfaces and classes in the org.ojalgo.matrix.store package. The 4 *Matrix classes are higher/application/logic level implementations with a fixed and limited feature set, while MatrixStore/PhysicalStore are lower/algorithm/implementation level interfaces offering greater flexibility and control. Initially all the lower level stuff was just implementation details preferably hidden to users. This has changed. The lower level stuff is since long open and available to use for anyone. It is also where most of the development has been lately. The higher level implementations are immutable. This can be very practical, but is an unusual feature for mathematical matrix classes, and most likely not what you expected. One of the things new users tend to get wrong is how to instantiate, and fully populate, an immutable matrix. Each of the two implementation layers support three element types: double, RationalNumber and ComplexNumber. (In addition there is support for Quaternion matrices, but to be honest we don’t know what that would be useful for.) Most people will just use the double implementations, but some need ComplexNumber. If the matrices are not too large and you need that extra precision you can use RationalNumber. The two layers are to some extent interoperable, but most users should choose either or. Have a look at both PrimitiveMatrix and PrimitiveDenseStore (assuming you need primitive double elements) and try to get some idea about the differences before you write too much code. Below is some code demonstrating how to do some basic stuff, as well as pointing out some differences between PrimitiveMatrix and PrimitiveDenseStore.